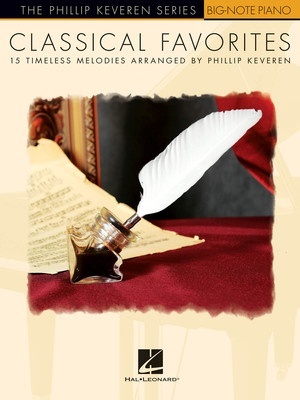 Phillip Keveren makes 15 classical melodies accessible to even beginning level pianists with this Big-Note Piano collection. Includes: Also Sprach Zarathustra (Strauss) • Canon in D Major (Pachelbel) • Eine Kleine Nachtmusik (Mozart) • Hallelujah Chorus (Handel) • Jesu, Joy of Man's Desiring (J.S. Bach) • Piano Concerto No. 1 (Tchaikovsky) • Symphony No. 5 in C Minor (Beethoven) • William Tell Overture (Rossini) • and more.